For the creature, see The Pale Lady (creature). Find out what happened in Frostmere Crypt. Fight deeper into the crypt. Banish The Pale Lady one way or another. While traveling near Frostmere Crypt, you may come upon several bandits attacking one of their own. Whether to help or not is up to you. Regardless of your choice, you will learn that some sort of thievery has occurred inside the crypt and the quest will begin, requiring you to investigate further. Alternately, you may start the quest without witnessing the bandit attack if Eisa Blackthorn is present outside the Crypt. She has her journal in her inventory which once read, also starts the Pale Lady quest. Fighting through the crypt, you can find two journals, one belonging to a leader of the bandits, Kyr, and one to a woman met earlier, Eisa. Reading both journals will update optional quest steps and reveal that the bandits found a hidden underground forest while digging for treasures. It is also revealed that Eisa's friend, Ra'jirr, seems to have started losing his mind soon after the forest was discovered. The opening area of Frostmere Crypt has two bandits talking at a table, and a third bandit off to the right in a side chamber. Opening the iron gate leads further down into the crypt. An iron door barred from the other side will force you into a large cavern on an upper walkway with bandits below. One bandit near a door lever from a west side position can be killed from a distance. Moving forward will bring you to a T-intersection - to the left is a guarded room with a grindstone, supplies and a bored bandit guard outside. The path to the right opens up into a large area leading immediately to three rooms. To the left is Kyr's room where there is one of the two journals, a chest and some basic loot. Straight ahead is another sleeping room with Ra'jirr's Note and Eisa's Journal. To the right is a lower level area and two more bandits. Two exits lead from the room. One is a drawbridge in the raised position, controlled by the west side position bandit above, so the only option is to pass through the door. Two more bandits are in this room with low level loot. A further passage leads around to a rock face being excavated and a bandit controlling the bridge lever. Activating the lever opens up the lower level mining area, with two more bandits and an iron ore deposit. A passage to the west leads down to another chamber with two more bandits and more mining tunnels. A tunnel leads downward and to the south, but be careful of a dead-fall trap. Another T-intersection leads to two choices. To the east is a small chamber with an empty chest and an ore deposit close by. To the west, the mine tunnels change more to a crypt-like setting and another bandit working a silver ore deposit. A door in this chamber leads to Frostmere Depths. Eventually you will reach the underground forest only to find the dying bandit leader mumbling his last words and Ra'jirr attacking The Pale Lady, a named Wispmother. 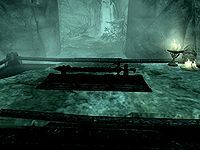 Quickly run up to Ra'jirr's body, loot the sword—appropriately named "The Pale Blade"—and place it onto the pedestal nearby, thus finishing the quest and banishing the Pale Lady. Save Ra'jirr from The Pale Lady using either Whirlwind Sprint or Slow Time before she has the chance to attack him. Pickpocket The Pale Blade from him, then place it on the pedestal. Ra'jirr will remain standing in front of the pedestal and will attack on sight, despite your having saved his life. Fight the Pale Lady. You can do this after having done one of the above by simply removing the sword from the pedestal. If desired, it can be placed back on the pedestal, re-banishing the Pale Lady, to give you a break during combat. Once the Pale Lady is killed, the quest will be complete with The Pale Blade as your reward. After you have slain The Pale Lady, make sure that you follow the path west-south-west of the pedestal until you get to the end of a rock formation, turn right and climb up to find another path that leads to a master-locked chest. If you follow the stream located on the eastern side of the pedestal, closer to the word wall, you'll find an orichalcum vein. On your way out, next to the iron doors, is a boss-leveled chest, and near it is a sword. On top of the staircase leaving the forest is a trigger-plate that will release poisonous darts. The next room has a bridge leading over a pool of water back to the entrance of the ruins. On the bottom is an adept-locked chest with some gold and a leveled magicka and a healing potion. Two soul gems, a piece of armor, a random potion and a leveled Battleaxe is also there. Frostmere Depths contains a word wall which teaches part of the Ice Form shout; it is to the right of the altar (as you face the waterfalls). Eisa and Ra'jirr were actually part of Hajvarr Ironhand's gang. They then mutinied and escaped, according to Hajvarr's journal. On that altar, you can recharge your Pale Blade anytime. A master-locked chest is located west of the Pale Lady's altar, an unlocked chest is near the word wall, and there's an adept-locked chest in the water in the room after the word wall along with a leveled battleaxe, leveled armor, and other minor treasures. Approaching Frostmere Crypt from the north may not trigger the quest. It's possible to find Eisa standing outside Frostmere Crypt, unharmed and alone. In order to get her journal, you have to either pickpocket or kill her. If you attempt to enter and exit the crypt with her standing outside, she may disappear from the game. Another option is to reload a different save file and approach Frostmere Crypt from the west road to trigger the event in which three bandits should be attacking Eisa. 90 In Frostmere Crypt, the spectral Pale Lady was released when a group of bandits stole the enchanted sword that sealed her tomb. By returning the sword to her altar, I returned her to her rest. 91 In Frostmere Crypt, the spectral Pale Lady was released when a group of bandits stole the enchanted sword that sealed her tomb. I killed her and claimed the sword as my prize. The following empty quest stages were omitted from the table: 0, 2, 3, 4, 10, 15, 16, 19, 20, 21, 30, 31, 40, 41, 50, 55, 60, 70, 75, 76, 85, 100. On the PC, it is possible to use the console to advance through the quest by entering setstage dunFrostmereCryptQST stage, where stage is the number of the stage you wish to complete. It is not possible to un-complete (i.e. go back) quest stages, but it is possible to clear all stages of the quest using resetquest dunFrostmereCryptQST.